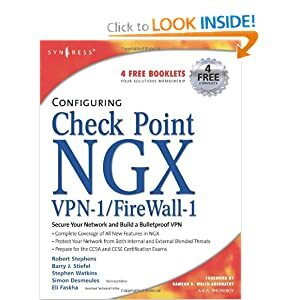 Check Point NGX VPN-1/Firewall-1 is the next major release of Check Point’s flagship firewall software product, which has over 750,000 registered users. The most significant changes to this release are in the areas of Route Based VPN, Directional VPN, Link Selection & Tunnel Management, Multiple Entry Points, Route Injection Mechanism, Wire Mode, and SecurePlatform Pro. Many of the new features focus on how to configure and manage Dynamic Routing rules, which are essential to keeping an enterprise network both available *and* secure. Demand for this book will be strong because Check Point is requiring all of its 3rd party developers to certify their products for this release. Now there’s a definitive insider’s guide to planning, installing, configuring, and maintaining the newest version of the world’s #1 firewall: Check Point™ FireWall-1® Next Generation™. Leading Check Point support authority Dameon Welch-Abernathy (a.k.a. PhoneBoy) offers exclusive hands-on tips, techniques, checklists, and detailed sample configurations you can use right now to improve reliability, efficiency, and manageability in your Check Point environment. 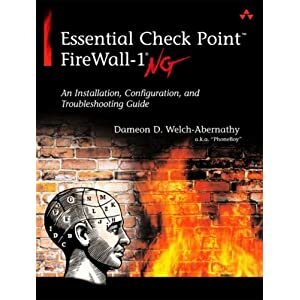 The author’s previous Check Point FireWall-1 guide became an instant bestseller, earning the praise of security professionals worldwide. 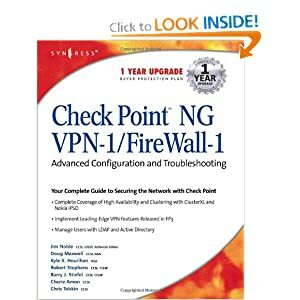 This new book has been thoroughly revamped to reflect Check Point FireWall-1 NG’s powerful new features, and it includes even more expert solutions from PhoneBoy’s FireWall-1 FAQ, the Web’s #1 independent Check Point support site. Whether you’re a security/network architect, administrator, or manager, you’ll find it indispensable. Whether you’re running FireWall-1 NG on UNIX or Windows platforms, this book brings together expert guidance for virtually every challenge you’ll face: building your rulebase, logging and alerting, remote management, user authentication, inbound/outbound content restriction, managing NAT environments, building site-to-site VPNs with SecuRemote, even INSPECT programming. Welch-Abernathy also covers high availability in detail, identifying proven solutions for the challenges of implementing multiple firewalls in parallel. Check Point Software Technologies is the worldwide leader in securing the Internet. The company’s Secure Virtual Network (SVN) architecture provides the infrastructure that enables secure and reliable Internet communications. Check Point recently announced a ground-breaking user interface that meets the industry’s next generation Internet security requirements, including simplified security management for increasingly complex environments. Built upon Check Point’s Secure Virtual Network (SVN) architecture, the Next Generation User Interface revolutionizes the way security administrators define and manage enterprise security by further integrating management functions into a security dashboard and creating a visual picture of security operations. The Next Generation User Interface delivers unparalleled ease-of-use, improved security and true end-to-end security management. Check Point’s revenues have more than doubled in each of the last two years, while capturing over 50% of the VPN market and over 40% of the firewall market according to IDC Research. The explosive growth of the company is further evidenced by over 29,000 IT professionals becoming Check Point Certified so far. 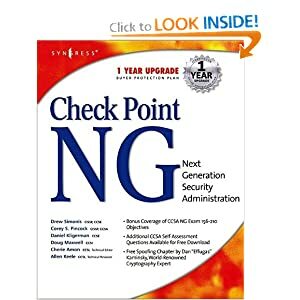 This book will be the complimentary to Syngress’ best-selling Check Point Next Generation Security Administration, which was a foundation-level guide to installing and configuring Check Point NG. This book will assume that readers have already mastered the basic functions of the product and they now want to master the more advanced security and VPN features of the product. Written by a team of Check Point Certified Instructors (the most prestigious Check Point certification) this book will provide readers with a complete reference book to Check Point NG and advanced case studies that illustrate the most difficult to implement configurations. Although not a Study Guide, this book will cover all of the objectives on Check Point’s CCSE Exam. · The reader will learn to design and configure a Virtual Private Network (VPN). · The reader will learn to configure Check Point NG for High Availability (HA), which is the ability of a system to perform its function continuously (without interruption) for a significantly longer period of time than the reliabilities of its individual components would suggest. · The reader will learn to use SeucureUpdate, which allows them to perform simultaneous, secure, enterprise-wide software updates. Check Point NGX R65 is the next major release of Check Point’s flagship firewall software product. Check Point’s NGX is the underlying security software platform for all of the company’s enterprise firewall, VPN, and management solutions. It enables enterprises of all sizes to reduce the cost and complexity of security management and ensure that their security systems can be easily extended to adapt to new and emerging threats. This title is a continuation of Syngress’s best-selling references on Check Point’s market leading firewall and VPN products.